Liam Cuttle’s birthday falls just before Halloween, so his parents usually invite guests to a “little monster” party where the kids can celebrate and show off their costumes. This year, the tradition will continue, but with a very important twist. This summer, Liam, who turns four on Sunday (Oct. 26), was diagnosed with neuroblastoma. His family is holding a Monster March in downtown Oakville that day and inviting community members to participate in support of the James Fund, with all proceeds going directly to the Hospital for Sick Children (SickKids) in Toronto for drug trials. Children are invited to wear their Halloween costumes and march through downtown Oakville. The group will meet in the Oakville Town Square outside the Green Bean (201 Lakeshore Rd. E.) at 11 a.m. The group will walk to the Oakville Fire Station at 125 Randall St. where they will enjoy cake and a chance to meet the firefighters and take photos with the fire trucks. 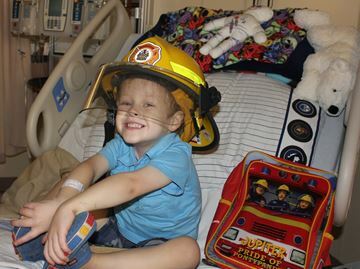 No one will be more excited than Liam, who dreams of being a firefighter and almost never takes off his red helmet. Liam was supposed to start junior kindergarten at W. H. Morden Public School in September, but instead has to stay home and in hospital. He still has his infectious laugh though, and continues to be as helpful as ever – even helping his nurses take his vital signs and prepare him for chemotherapy. Neuroblastoma is a cancer of the sympathetic nervous system that usually affects infants and young children. Neuroblastoma can develop anywhere in the body, but most often occurs in the adrenal gland. Other sites include the neck, chest, spinal cord or pelvis. Signs and symptoms of the disease will vary with the location. It is the third most common pediatric cancer (after leukemia and brain tumours). About 50-75 children are diagnosed in Canada each year. Children with high-risk neuroblastoma, like Liam, have a 50 per cent survival rate. Neuroblastoma has the lowest survival rate of all childhood cancers. It is responsible for 12-15 per cent of pediatric cancer deaths. “That’s why we’re doing this. We need research to bring it up to speed with leukemia, which has much more favourable survival rates because of research over the last decades,” Anderson said. Before being diagnosed on Aug. 19, Liam experienced stomachaches for a couple of months. Since Anderson has a dairy allergy, she and Liam’s dad, Andrew Cuttle, assumed Liam was developing one too. Then Liam started having recurring fevers. After many trips to the doctor, the family went to the emergency room and were sent to SickKids hospital. Liam just completed his third round of chemotherapy and is responding well. He will be in hospital on Halloween for his fourth round. After six rounds, Liam will have surgery to remove his tumour, followed by a stem cell transplant, radiation and immunotherapy. Community members are invited to join the Monster March Sunday (Oct. 26) at 11 a.m. Funds raised will support research to find treatments for children who relapse, as half of all children with neuroblastoma do. To donate, search for The Fighting 4 Liam Brigade’s Monster March on Facebook for information and a link to the donation page. If you are unable to attend the Monster March, donations are still welcome.